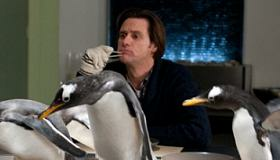 Mr. Popper's Penguins has hatched a refreshing, hilarious and heartwarming movie for everyone. This contemporary adaptation of the 1938 classic kids book by Richard and Florence Atwater pits Jim Carrey's antics against a six pack of cute penguins who crack open his seemingly successful life and teach him the importance of family and humanity. With penguin-themed hits like March of the Penguins and the Oscar winning Happy Feet still a fond memory, expect families to march in lockstep to their multiplex to see this irresistibly fun flick. After last week's abysmal Judy Moody and the Not Bummer Summer invested no effort in making a decent kid movie, along comes this perfect vehicle for Carrey, who could use a mainstream hit. In a role that would have been tailored for Eddie Murphy in his prime Doctor Dolittle days (John Davis also produced those animal-friendly comedies), Carrey demonstrates the full range of his comedic talents as he's pitted against a group of wily birds from Antarctica when his late father sends them packing to his son's Park Avenue apartment front door. At first, there's just one, but then five more show up to disrupt the ordered life of Mr. Popper (Carrey), a successful real estate developer and divorced father of two who is living large (and lonely) in his posh bachelor pad. He desperately tries to unload the birds, but eventually his swank digs are turned into a winter paradise. Of course, complications arise professionally, where a deal he needs to close comes apart; and personally as his kids angle to fix him back up with his ex-wife (Carla Gugino). Although the film is full of slapstick moments of Carrey trying to keep these busy creatures in line, it also develops a surprisingly real and heartwarming family relationship for him. He's terrific and so is Gugino who has a nice, warm chemistry with the film's star. And it's nice to see veteran Angela Lansbury for a few scenes as a society woman Carrey charms for the sake of a sale. Clark Gregg is also fine, if a bit one-note, as a zoo employee with a legit argument that the birds need expert care. Perhaps most impressive is the work of Scott Drieschman, trainer for these remarkable penguins. Not exactly the easiest, most empathetic species, these creatures have the audience in the palm of their flightless wings. Rating: PG for mild, rude humor and some language.